What’s better than something that works? Something that works even better. 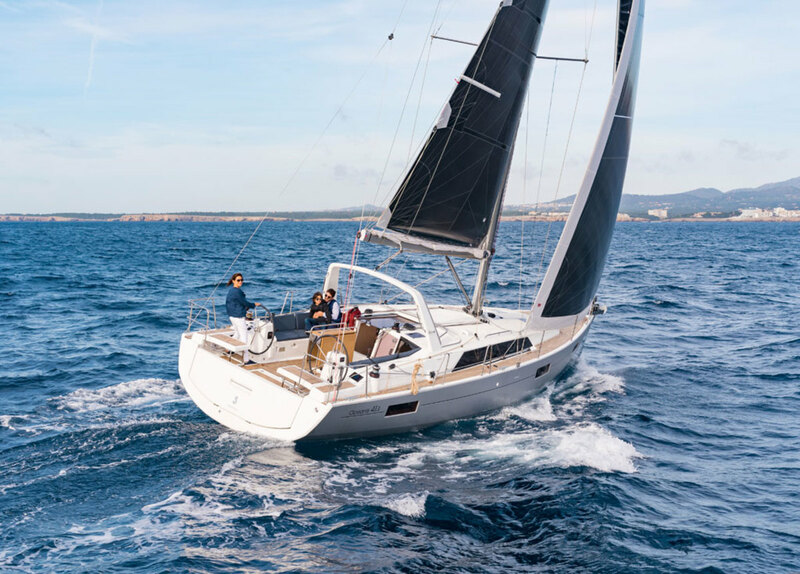 With this in mind, Beneteau reviewed its Oceanis 41—a model at a very popular length—and with owner feedback and some clever engineering, launched the new and improved Beneteau Oceanis 41.1 at this year’s Miami Boat Show. 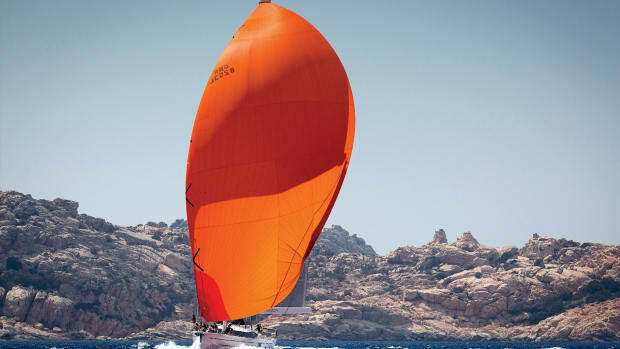 The result is better performance and a more ergonomic interior, not to mention fun sailing, even in light winds. The Finot-Conq-designed hull remains mostly the same. 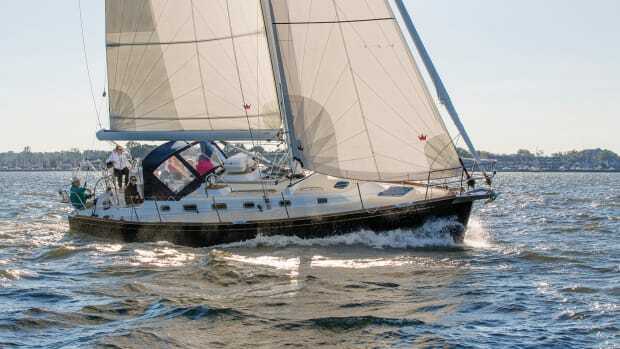 The bow is still blunt, and the 13ft 9in beam is carried well aft, while hard chines in the stern sections continue to both increase interior volume and reduce heel—keeping it 5 degrees less than on competitive models in her size range, according to Beneteau engineers. The flat bottom, single spade rudder and a keel that is available in either a 7ft 2in deep or 5ft 6in shoal-draft version are also all elements we’ve seen before. Lest anyone think there are no changes to this design, however, Beneteau has also slimmed the boat down by an impressive 1,200lb. The savings came about by reducing the amount of interior wood trim and changing up the transom, which still drops down to form a swim platform, but no longer sports the full-width lip that previously served as a seat. Instead, there are now a couple of lightweight seats at the twin wheels that hinge up and out of the way when not in use. Not only does this make the whole transom section lighter, it also opens up the aft deck with a clearer path to the water when the seats are not in use. The Z-Spars mast was also moved aft, freeing up additional space down below and opening up the foretriangle. 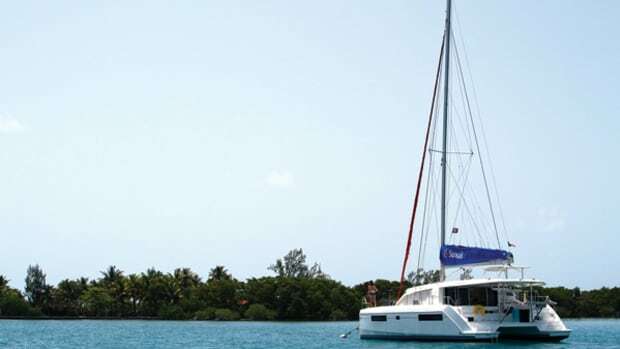 The boat’s standard rig includes a 95 percent self-tacking jib on a Facnor furler that sheets to a track just ahead of the mast. Larger headsails can be led to a pair of tracks just outboard of the cabintrunk.  The Beneteau Ocenais 41.1 is all about the cockpit. Two seats are separated by a massive drop-leaf table with an optional fridge in one end and Beneteau’s signature removable cockpit light in the other. When only one guest cabin is chosen below, the port cockpit settee opens up to reveal cavernous storage space for everything from fenders and lines to a place for optional equipment installations. Twin helms, with optional carbon wheels, allow for outboard steering and clear sightlines forward. Engine controls are on the port side only, but B&G multifunction displays can be mounted on both sides. The German mainsheet system has an attachment point on the integrated arch, which also provides good handholds when moving forward. The lifelines are low, as they tend to be on production boats, but there are two nice, long side gates to make loading gear from the dock or a dinghy much easier. The mooring cleats are satisfyingly beefy and will hold a 1in line without any problem. 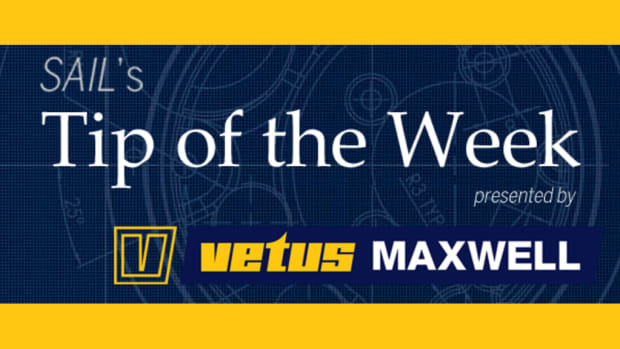 The bow pulpit is open, while a sprit to attach a downwind sail and a double bow roller is available as options, as is in-mast mainsail furling. 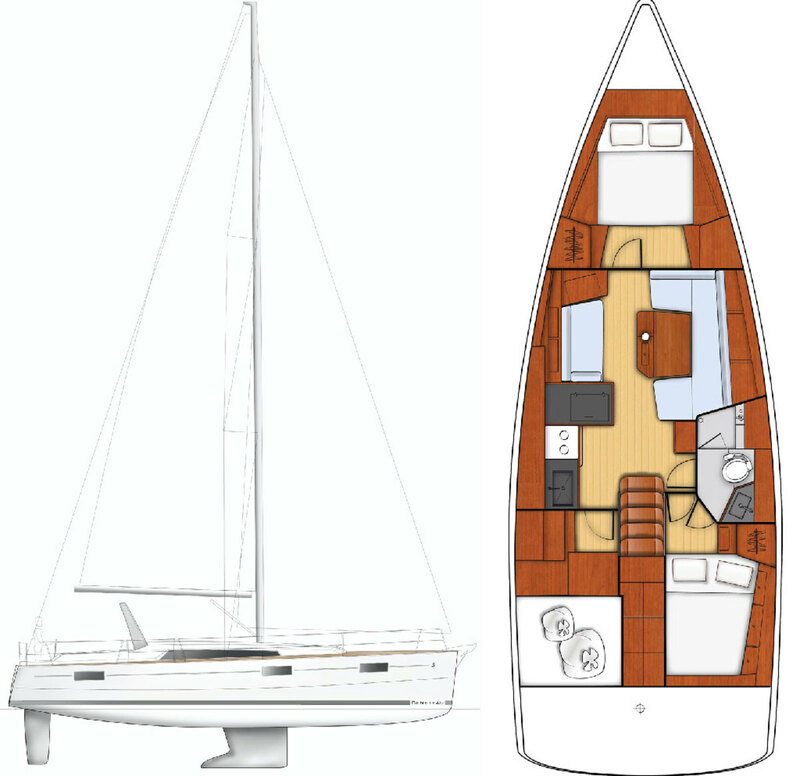 There are four layout options in which only the fore and aft ends change while the saloon, galley and head remain the same. 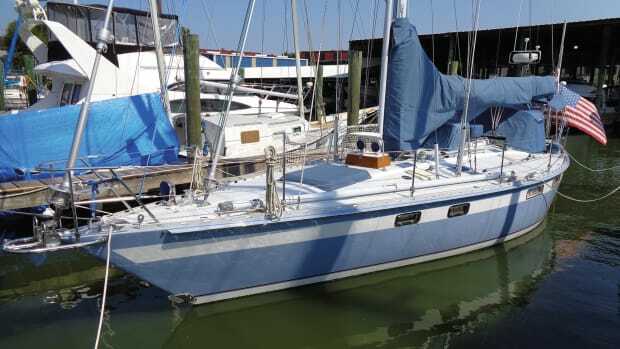 The greatest improvement over the Oceanis 41 was made in the master stateroom forward, which gained space as the mast moved aft with the compression post now cutting through the saloon table. Double doors provide privacy to the cabin; however, if a couple is aboard alone, the doors can be kept open, making the boat feel longer and more spacious. The island berth is either on the centerline, which makes it easy to get into, or angled to starboard if a private head is added. 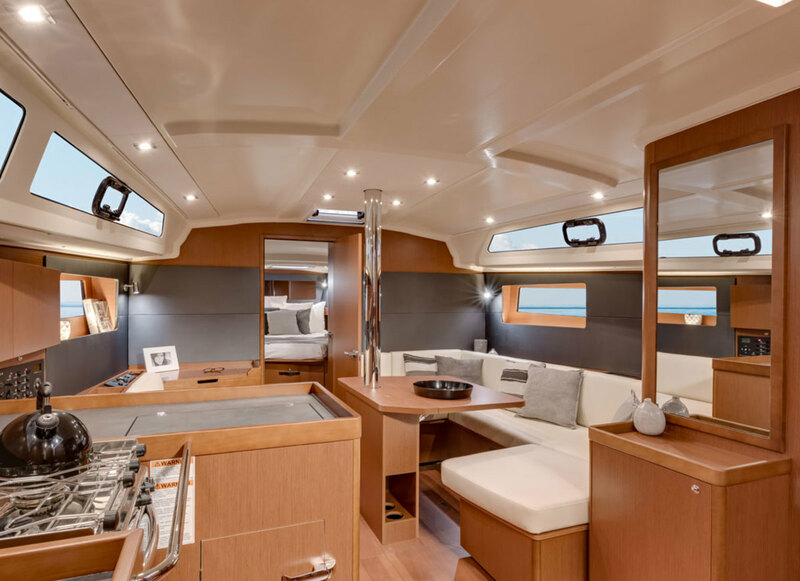 Personally, I think a 40-footer doesn’t really need two heads, especially aboard the Beneteau 41.1, since without the added bulkheads the stateroom enjoys that much better ventilation with three overhead hatches—a welcome detail in hotter climates. The whole cabin seems to have grown into itself with room for lockers and a place to dress even with the doors closed. 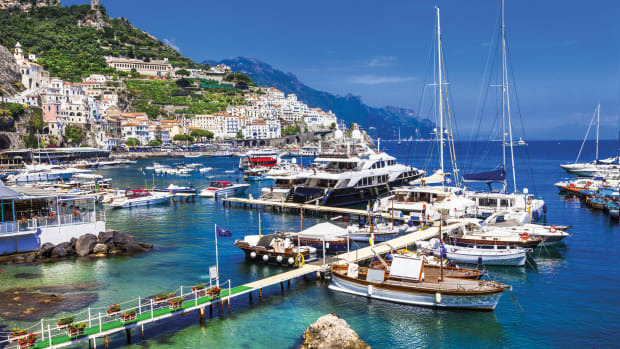 I expect the centerline berth to be the most popular for U.S.-based couples. A small forward-facing desk was added in the saloon aft of the master stateroom bulkhead. Some may not see much use in it, but I like having a dedicated desk in which to keep cruising guides, handheld radios, ship’s keys and so forth. To starboard is a U-shaped settee and a large drop-leaf table that connects the two sides of the boat for dining. True to form on a French boat, there are three bottle storage areas aboard, two of which are housed in this table. The galley is L-shaped and to port with a two-burner Eno stove, Vitrifrigo top and side-loading refrigeration, a single sink and soft-close drawers for plenty of storage. Across is a small cabinet topped by a mirror, both of which are attached to the bulkhead that encloses the aft head with separate shower stall. Again, two cabins aft are an option, or you can leave the guests to starboard, reserving the entire port side for the aforementioned storage, which would be my preference. The best way to test a boat is in either a lot of wind or nearly none, and we got the latter on Biscayne Bay, with a very light breeze of 6 to 8 knots. This is a speed at which boats either prove to be nimble or falter, and I’m happy to report that the Beneteau Oceanis 41.1 did just fine. With the upgraded Elvstrøm laminate sails, we glided along at 6.9 knots in 8 knots of true wind at 75 degrees. The boat accelerated noticeably to 7.5 knots in a 10-knot puff as we fell off to a beam reach. That speed decreased to 3.7 knots as we ran off at 150 degrees, and we wished we had a Code 0. But since this was only hull #3, the entire suite of sails was not yet available. At the end, despite the light conditions, there were smiles all around as the entire crew agreed that the 41.1 was the most enjoyable test sail we had done all day. With just under 18,000lb of displacement, the boat’s 45hp Yanmar with saildrive has plenty of power. On flat water in a light breeze, we maxed out at 3,000 rpm going 8.5 knots. A fast cruise would be more like 7.4 knots at 2,200 rpm. While 53 gallons of fuel is not a lot by oceangoing standards, it provides a range of nearly 600 nautical miles at 5.5 knots if the engine burns a half a gallon per hour at that speed. I like the whole new Oceanis line, which includes models from 38ft to 60ft, but a 41-footer really hits the spot for many couples. Previously, sailors were forced to step up to the 45 if they wanted a liveable master stateroom with an island berth. However, for many that was too much boat for too much money. That’s why Beneteau’s revamp of this model is so welcome. Again, they’ve taken something that already worked and made it that much better. 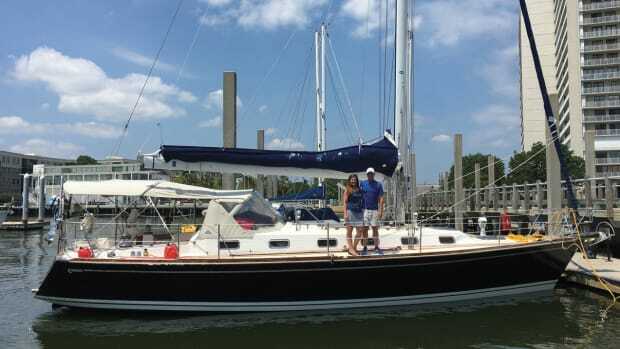 For more SAIL Boat Reviews, click here.